TOURON's affiliated company TRIKALA FARMS LTD produces a wide range of innovative products from its operational center in the fertile area of Thessaly. The company aiming even higher today with its cutting-edge brand new packing unit and aims to offer the best service and quality of its product line. are between others some of the products that the company produces. 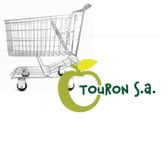 TOURN S.A. represents in Greek market some of the biggest Brands in the field of fresh fruit and vegetable trade.